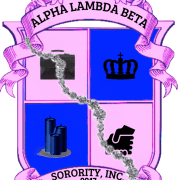 Alpha Lambda Beta Sorority, Inc. Alpha Lambda Beta Sorority, Inc.
Alpha Lambda Beta Sorority is a greek sorority with graduate chapters of Alpha Lambda Pi & Chi Kappa Epsilon. We are a national & international organization that aim at family's whom are experiencing tough times with food, clothing, toys & educational essentials for children, assist is scholarships & to assist in education financials, promote awareness for causes. Our history includes promoting awareness for Susan B Komen, raising money & collecting supplies for kids heading back to school, our annual food & toy drive, raise money for individuals whom are continuing their education & need financial help etc. We also take donations for the organization to keep us moving forward to provide for the communities in the U.S. We will need volunteers in the following areas, Memphis, Tennessee, Linden, North Carolina, Manvel, Texas, Jackson, Tennessee & Austin Texas to assist our members with our missions of giving back! Our achievements: Raising over 1000+ to help people in need & seeing the smiles on our community faces. Our goal is to assist our communities anyway possible to make their life better. Would you recommend Alpha Lambda Beta Sorority, Inc.?